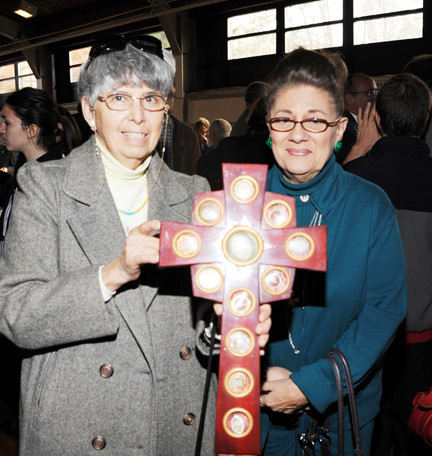 Participants at St. Philomena’s conference Nov. 13 were later able to venerate the crucifix, center, containing relics of the saint. When most Catholics think of saints who represent youth and children, certain names are likely to come to mind: St. Therese of Lisieux, a Discalced Carmelite mystic and doctor of the Church affectionately known as the “Little Flower of Jesus;” St. Maria Goretti, a young virgin who gave her life rather than submit to a young man’s seduction; and St. Nicholas, a fourth century bishop of Myra who, in legend, saved three young women from prostitution by throwing bags of gold through their windows. But one patroness of youth may not be as celebrated — St. Philomena, a virgin martyr of the early Church. Believed to be a fourth century Greek princess, she apparently faced a hostile world in the Roman Empire, which could certainly be referred to as a “culture of death” because life had no value and power and pleasure were everything. When Philomena, who was 13, refused to marry Emperor Diocletian, he ordered her execution. At St. Philomena Parish in Lansdowne, young people learned more about their patroness by attending a conference titled “It’s Time to Meet St. Philomena” on Nov. 13. The goal of the conference was to introduce young people from the Archdiocese to St. Philomena, and to increase devotion to her. The conference began with Mass followed by an afternoon of prayer, praise, hymns and presentations. During Mass, Father Jason Kulczynski, parochial administrator of St. Philomena Parish, welcomed Msgr. Giovanni Braschi, rector of the Shrine of St. Philomena in Mugnano, Italy, who preached the homily. One of the conference presenters was Dr. Mark Miravalle, author of the book, “It’s Time to Meet St. Philomena.” “Devotion to this power saint is spreading like a rekindled wildfire throughout the universal Church today, with testimonies to her miraculous intercession being received by the international shrine in Mugnano from all parts of the world,” Miravalle said. Also presenting a lecture was Father Chad Partain, chancellor of the Diocese of Alexandria, La., and director of the archconfraternity’s youth campaign. The Archconfraternity of St. Philomena, together with the Universal Living Rosary Association, have initiated a campaign to familiarize young people with St. Philomena and to enlist them in the work of evangelization. The priest spoke about how the devotion to St. Philomena can transform lives and bring people closer to Jesus and His Blessed Mother. “In addition to teaching young people about their patroness, we also hope to re-establish participation in the Congregation of the Children of Mary,” said Father Partain, who received a special grace through the intercession of St. Philomena. During his junior year in high school, he was afflicted with a severe cholesteatoma, a destructive growth that ate through three small bones inside his left ear. He was not expected to hear again, or even walk, but his family prayed for St. Philomena’s intercession, and he was completely cured, including the ability to hear on the left side. “After surgery, I was expected to have nothing but a gaping cavity where my left ear had been, but that didn’t happen,” Father Partain said. Approximately 350 people attended the Mass and about 250 stayed for the conference, which ended with exposition and benediction of the Blessed Sacrament, and the novena to St. Philomena. George Gregory is a freelance writer and a parishioner of St. Cecilia in Coatesville.